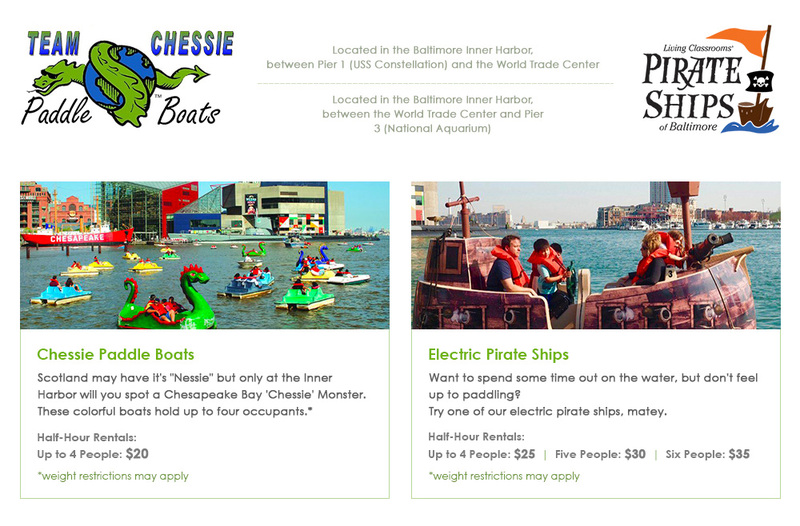 Operated and managed by Living Classrooms Foundation in Baltimore’s Inner Harbor, the Chessie Dragon paddle boats and electric Pirate Ships of Baltimore are popular family-friendly attractions among area residents and visitors from around the world. They also serve as employment venues for youth and young adults as an extension of our job training programs, often providing Baltimore City youth with their first job experience. Combined, the two venues employ approximately fifty teens and young adults each year. The attractions are open daily, April through November, weather permitting. Proceeds from ticket sales support Living Classrooms’ hands-on education and job training programs. The original Chessie Dragons have become an iconic fixture in Baltimore’s waterfront landscape and have served hundreds of thousands of visitors since the attraction opened in 1975. These pedal-powered boats seat up to 4 passengers each and have become a popular destination for family day trips, unique dates, and even marriage proposals. Living Classrooms began operating the Chessie Dragon paddle boats in 1999. In 2018, Pirate Ships of Baltimore was unveiled as the newest attraction in the Inner Harbor. Located between the World Trade Center and the National Aquarium Pier 3, the dock houses a fleet of 12 electric boats that hold up to 6 passengers each. A clean energy alternative, the Electric Pirate Ships operate on lithium ion battery power, fueled by solar energy and provide fun for children and adults of all ages who want to storm the harbor. Sponsorships of this attraction are available for companies who wish to invest in our community, build their brand, support jobs for city youth, and increase Baltimore City’s tourist experience. Inquiries should be made to Thara Taylor.